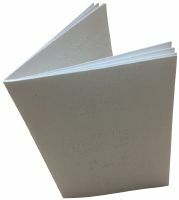 Include Braille Rules on How to Play Chess for $5.00? Wooden playing board with 32 plastic men. Each white playing piece has a tactile dot on top. Playing pieces are shaped differently to aid in tactile identification. A peg on the bottom of each piece fits snugly into the board, so they can be felt during game-play. Black squares on the board are raised to help track diagonals. Measures about 14 in by 9 in by 1 in. Package Weight: about 1.6 pounds. Here's an elegant full-sized, completely tactile chess set for blind and visually impaired players - and their sighted friends and families. First of all, the large 9" X 13" wooden board is beautifully hand-painted with brightly contrasting colors for the black and white squares. What's more, the black squares are raised to make it a snap for anyone playing the game by touch to tell them apart from the white squares. And each square itself has a hole in the center, which the peg at the bottom of each piece snugly fits into. (This ensures that no chessmen will ever get knocked over or end up on the wrong squares.) At each end of the board are two capture rows - for you to use in storing and showing off your opponent's fallen men. The sturdy, plastic chess pieces themselves are shaped differently, too; so it's easy to tell a pawn from a knight or the rook from the almighty king. Plus ... you guessed it ... each white piece has a large dot on the very top so that blind players can easily "see" whether each piece is theirs or their opponents. Chess is a game played by two players. 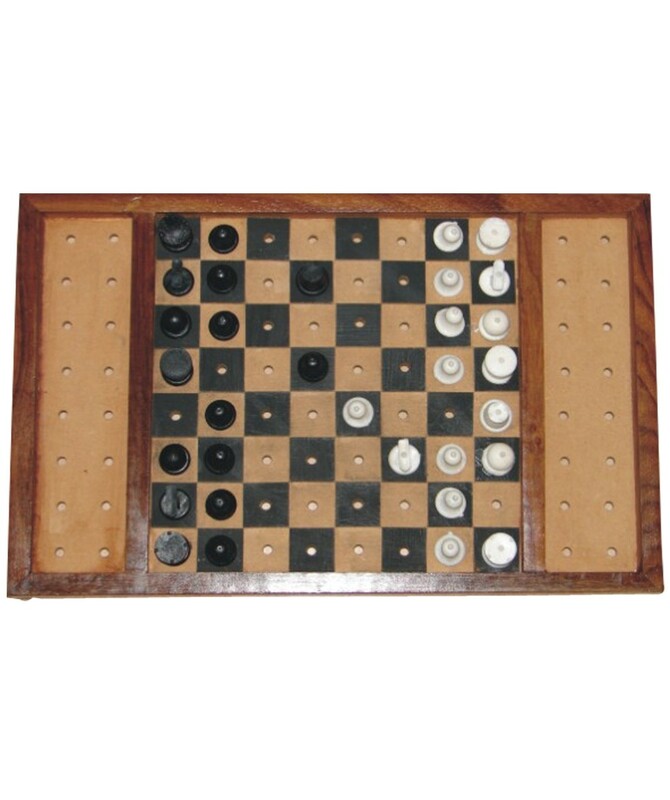 One player plays with the white pieces (the ones with the tactile dot on top), and the other player plays with the black pieces. Each player has sixteen pieces in the beginning of the game: one king, one queen, two rooks, two bishops, two knights, and eight pawns. The game is played on a chessboard, consisting of 64 squares: eight rows and eight columns. The squares are alternately light (white) and dark colored. The board must be laid down such that there is a black square in the lower-left corner. To facilitate notation of moves, all squares are given a name. From the view of the white player, the rows are numbered 1, 2, 3, 4, 5, 6, 7, 8; the lowest row has number 1, and the upper row has number 8. The columns are named, from left to right, a, b, c, d, e, f, g, h. A square gets a name, consisting of the combination of its column-letter and row-number, e.g., the square in the lower left corner (for white) is a1. Alternately, the players make a move, starting with the white player (the player that plays with the white pieces.) A move consists of moving one of the pieces of the player to a different square, following the rules of movement for that piece. There is one special exception, named castling, where players move two pieces simultaneously. At the start of the game, the position of the pieces is as follows. At the second row, there are eight white pawns, at the seventh row, there are eight black pawns. At the first row, from left to right, we have a: rook, knight, bishop, queen, king, bishop, knight, and rook. The eighth row is the same as the first row. Note that the queens start on squares of their own color, with a dark square in each players left hand corner. The bishop moves in a straight diagonal line. The bishop may also not jump over other pieces. The queen has the combined moves of the rook and the bishop, i.e., the queen may move in any straight line, horizontal, vertical, or diagonal. The knight makes a move that consists of first one step in a horizontal or vertical direction, and then one step diagonally in an outward direction. The knight jumps: it is allowed that the first square that the knight passes over is occupied by an arbitrary piece. For instance, white can start the game by moving his knight from b1 to c3. The piece that is jumped over is further not affected by the knight: as usual, a knight takes a piece of the opponent by moving to the square that contains that piece. The pawn moves differently regarding whether it moves to an empty square or whether it takes a piece of the opponent. When a pawn does not take, it moves one square straight forward. When this pawn has not moved at all, i.e., the pawn is still at the second row (from the owning players view), the pawn may make a double step straight forward. For instance, a white pawn on d2 can be moved to d4. When taking, the pawn goes one square diagonally forward. There is one special rule, called taking en-passant. When a pawn makes a double step from the second row to the fourth row, and there is an enemy pawn on an adjacent square on the fourth row, then this enemy pawn inthe next move may move diagonally to the square that was passed over by the double-stepping pawn, which is on the third row. In this same move, the double-stepping pawn is taken. This taking en-passant must be done directly: if the player who could take en-passant does not do this in the first move after the double step, this pawn cannot be taken anymore by an en-passant move. The king moves one square in any direction, horizontally, vertically, or diagonally. There is one special type of move, made by a king and rook simultaneously, called castling: see below. The king is the most important piece of the game, and moves must be made in such a way that the king is never in check: see below. Castling. Under certain, special rules, a king and rook can move simultaneously in a castling move. The following conditions must be met: The king that makes the castling move has not yet moved in the game. The rook that makes the castling move has not yet moved in the game. The king is not in check. The king does not move over a square that is attacked by an enemy piece during the castling move, i.e., when castling, there may not be an enemy piece that can move (in case of pawns: by diagonal movement) to a square that is moved over by the king. The king does not move to a square that is attacked by an enemy piece during the castling move, i.e., you may not castle and end the move with the king in check. All squares between the rook and king before the castling move are empty. The King and rook must occupy the same rank (or row). When castling, the king moves two squares towards the rook, and the rook moves over the king to the next square, i.e., white's king on e1 and rook on a1 move to: king c1, rook d1 (long castling), white's king on e1 and rook on h1 move to: king g1, rook f1 (short castling), and similar for black. Check. When the king of a player can be taken by a piece of the opponent, one says that the king is in check. For instance, the white player moves his rook to a position such that it attacks the black king, i.e., if black doesn't do anything about it, the rook could take the black king in the next move: we say that the white rook gives check. It is considered good manners to say "check" when you check your opponent. You are not allowed to make a move, such that your king would be in check after the move. If a player accidentaly tries to make such a move, he must take the move back and make another move with the same piece. Move the king away to a square where he is not in check. Take the piece that gives the check. (In case of a check, given by a rook, bishop or queen:) move a piece between the checking piece and the king. Stalemate. When a player cannot make any legal move, but he is not in check, then the player is said to be stalemated. In a case of a stalemate, the game is a draw.